Days after the Redmi 7 was finally launched in Xiaomi’s home country of China, the device has commenced its global journey with the launch taking place in Ukraine. The phone was launched in China on Monday, and today, Ukraine’s official Facebook page has announced that the device will now indeed be available for online Pre-orders in the country at partner retailers. The page based on Facebook has also revealed that the device will in fact be available for purchasing offline at the official Mi store. With that said, having 60 stores in Ukraine, potential customers should have no problem purchasing the phone offline. The mid-range budget device’s will be available for $147/€130 for the base model – which will feature with 2 gigs of RAM and 16 gigs of internal storage. 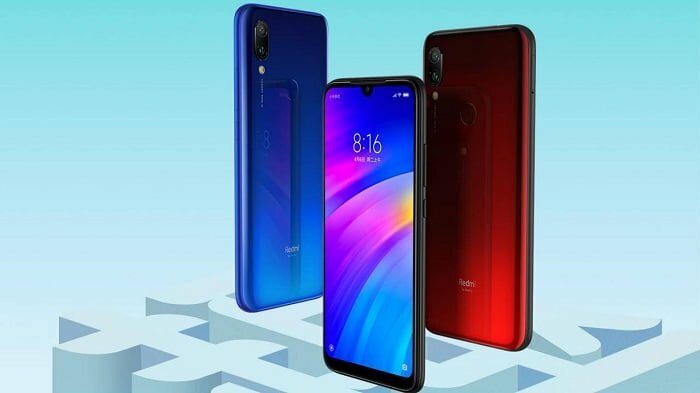 The Redmi 7 does not have a compact design found on its predecessors, while also having a gradient finish. The phone features with a 6.26-inch HD+ display, along with a resolution of 1520 x 720 pixels. The phone features with a 19:9 aspect ratio, while carrying support for 84 percent of the NTSC colors. Considering the fact that the device features with a TUV Rheinland display, the users should not face any eye fatigue because of the fact that the phone effectively manages to reduce the emission of harmful blue rays. The display also features with a corning gorilla glass 5 panel on top. The phone is powered by the Snapdragon 632 SoC coming either 2, 3, or indeed 4 gigs of RAM – all being dependent on the variant you end up with. As far as the internal storage is concerned, the device features with either 16, 32 or indeed 64 gigs of storage. On the rear of the device, we have a dual camera setup of 12MP + 2MP, and as far as the selfie camera is concerned, there happens to be an 8MP sensor on the front. The selfie camera also comes with other features such as AI beauty, and also AI Face unlock. There will feature a 4000mAh battery. The phone features with a 3.5mm audio jack.